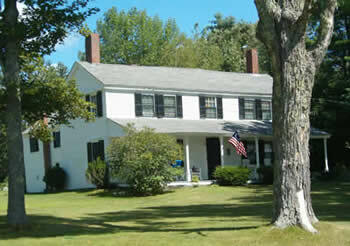 New England communities were originally settled by people who were willing to take risks and work hard to create a life in a new territory that was full of promise. 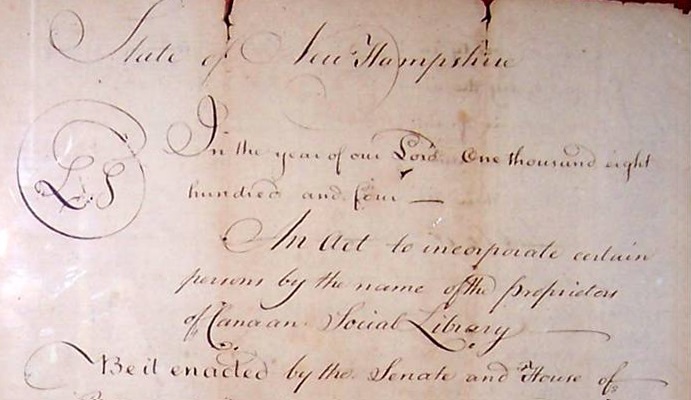 In 1767, people moving to Canaan banded together to survive, to worship freely and for mutual benefit and support. They grew stronger and prospered through their efforts on the land and by creating goods using the power of the area's rivers and brooks. 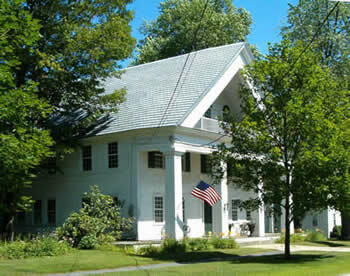 The Upper Valley has a rich tradition of manufacturing based initially on the availability of water power and water transportation. 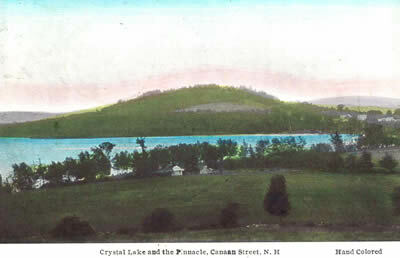 As the centuries passed, the traditional trades of farmers, loggers, craftsmen and manufacturers were joined by folks that traveled by rail and later by car to share in the bounty of Canaan's lakes, mountains, vistas and community spirit. A deep support of education came with these settlers, and rooted itself here. 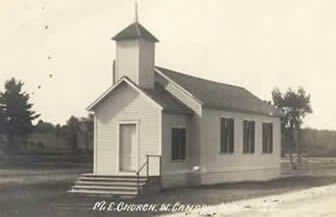 In March 1835, 28 white students and 14 black students commenced classes at the newly established Noyes Academy in Canaan. 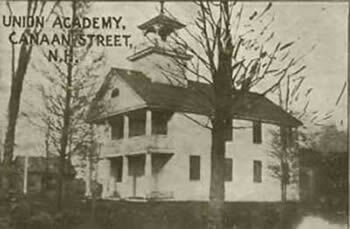 This Academy was the first educational institution that assured that education was accessible to all regardless of race. 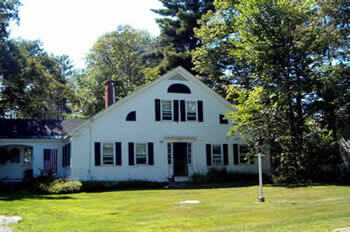 In the late 1940's Cardigan Mountain School was formed next to Canaan Street Lake near the original site of Noyes Academy. 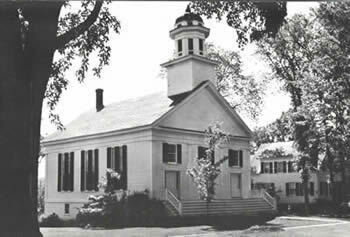 Other schools included Canaan College and Union Academy, now the home of the Canaan Museum. 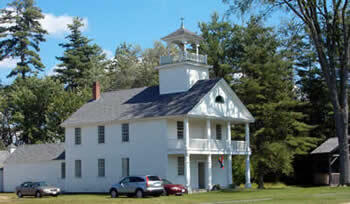 Cardigan Mountain School eventually moved to a prominent point on the Lake and continues to offer opportunities in educational excellence to this day. 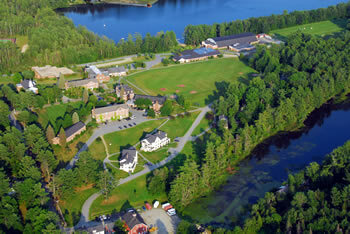 Today, nestled equidistantly between Dartmouth College (A) and Plymouth State University (B), the town reaps the benefits of nearby educational and cultural experiences while still retaining its rural character. 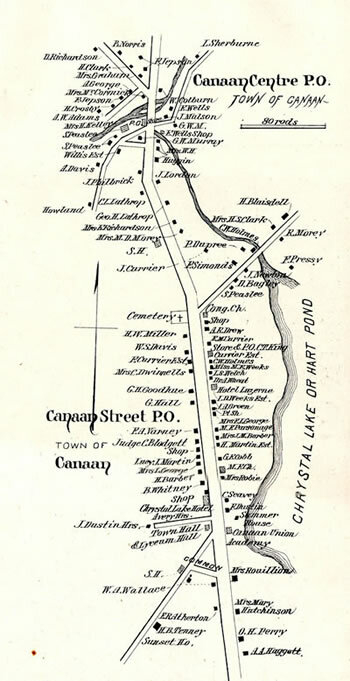 The community of Canaan has welcomed and benefited from a long history of entrepreneurs and educators who used their creativity to make a better life for themselves, their families and their neighbors. 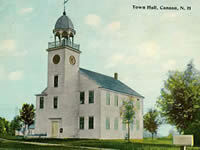 We invite you to join us in carrying out the promise & heritage of the Town of Canaan today! 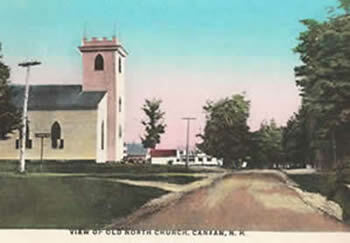 Chartered in 1761 by Governor Benning Wentworth, the town was named after the hometown of many early settlers, Canaan, Connecticut, which had been named for the biblical land of Canaan. 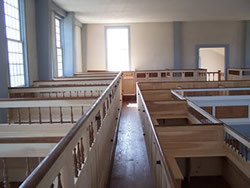 It was settled in the winter of 1766-1767 by John Scofield, who arrived with all his belongings on a hand sled. 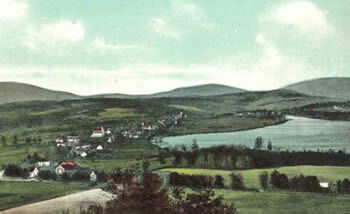 With an unbroken surface, the town was suited for agriculture. 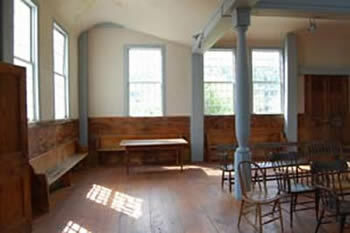 Grain mills, built along the rivers, became centers of activity for business. 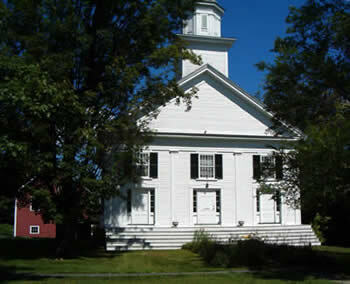 A meeting house was erected in 1796. 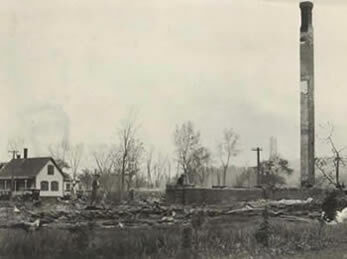 Lumber mills soon provided boards for larger and more substantial houses. 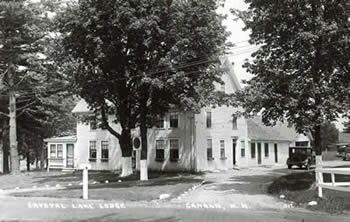 Broad Street or Canaan Street near Canaan Street Lake was the focal point of the early thriving community. 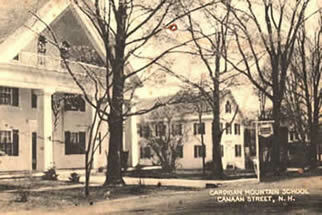 Canaan Center was the home of mills and stores. 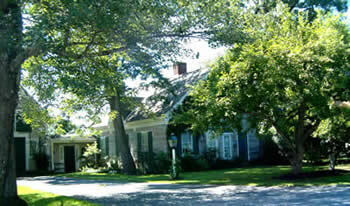 As the community grew, roads were laid out and built beginning with South Road in 1774. 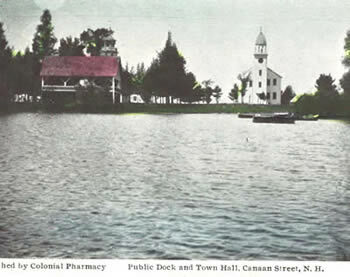 Many roads built in the late 1770's and 1780's led directly to the Eames corn mill by the outlet of Harts Pond (also called Crystal Lake and now called Canaan Street Lake). 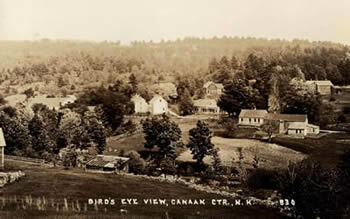 Villages sprang up in West Canaan and East Canaan (now Canaan Village). 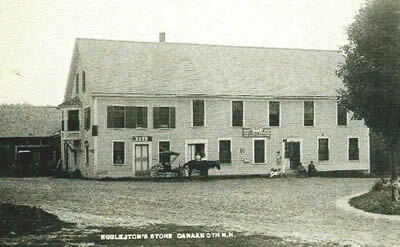 Expansion in East Canaan (Canaan Village) was at first stimulated by the nearby Fourth New Hampshire Turnpike. 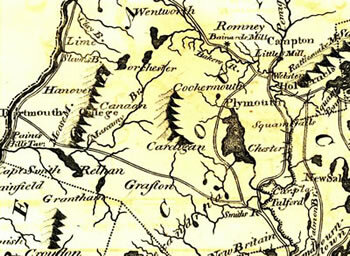 The Northern Railroad (predecessor of the Boston & Maine Railroad) arrived in 1847, spurring development. 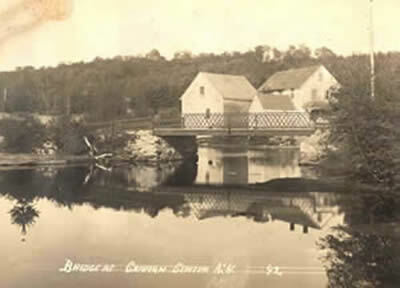 Water powered mills were built on the streams. 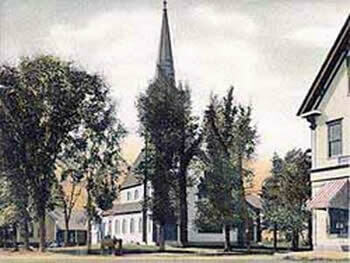 By 1859, when the population was 1,682, Canaan had one gristmill, three lath and clapboard mills, and one tannery. 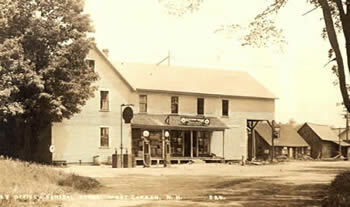 The downtown area grew rapidly after the railroad company built its depot on land offered by Richard Hutchinson, a local farmer. 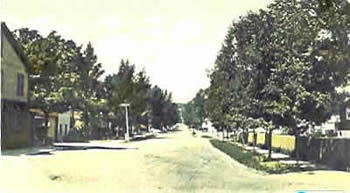 The Village was soon a major commercial center. 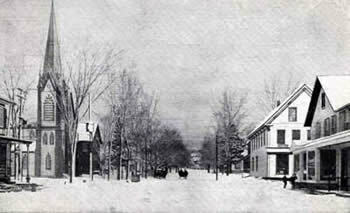 By 1884, more than 33 small businesses were active downtown. 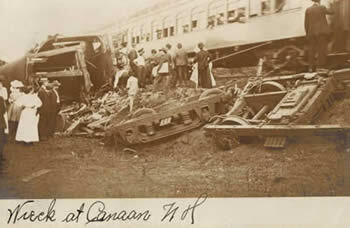 On September 15, 1907 Canaan was the site of a famous train wreck. Four miles north of Canaan Station, the southbound Quebec to Boston express, heavily loaded with passengers returning from the Sherbrooke Fair, collided head-on with a northbound Boston & Maine freight train. 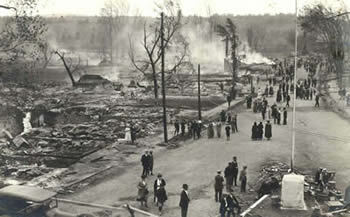 Twenty-five people perished, and an equal number were seriously injured. Cause of the accident was "due to a mistake in train dispatcher's orders." 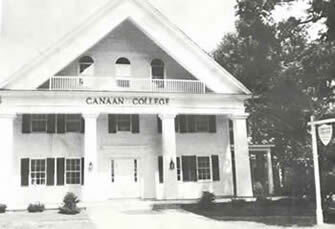 A live recording of Canaan Train History can be heard on the Canaan Historical Museum Page. 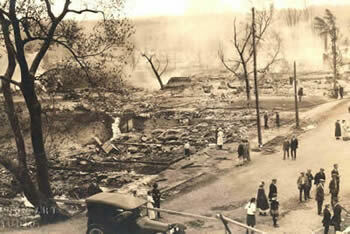 On June 2, 1923, another disaster destroyed the heart of Canaan Village (East Canaan). 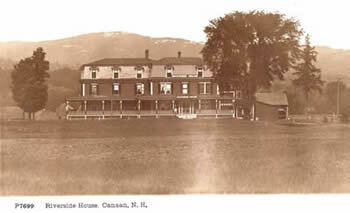 The Great Canaan Fire burned 48 homes and businesses. 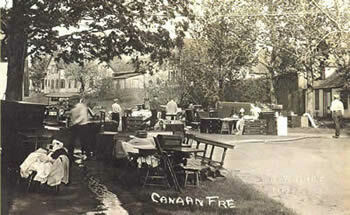 The great fire of 1923 completely destroyed the heart of Canaan Village. 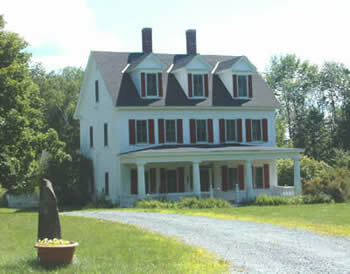 Only the veterans monument remained. 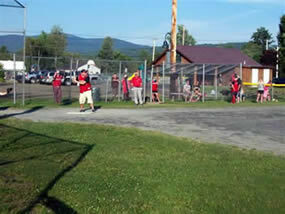 Rebuilding and reinvestment took place immediately. The sturdy buildings that rose on the Corner of Main and Depot streets tell us that there were great expectations for the future of the business district. 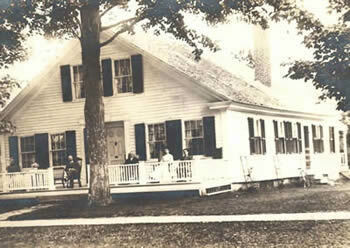 The new post office, hardware store, pharmacy, and train depot were opened with pride. 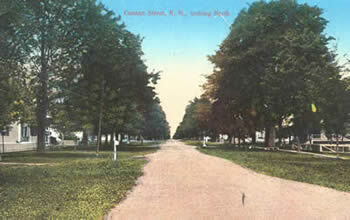 Elm trees were planted along the curbstone sidewalks. 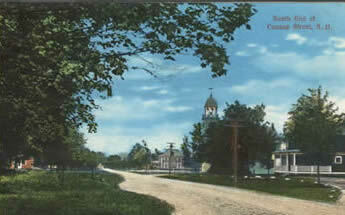 A new section of Route 4 cut through the village providing the increased number of motorists and visitors with a major link to the cities of Concord and Lebanon. 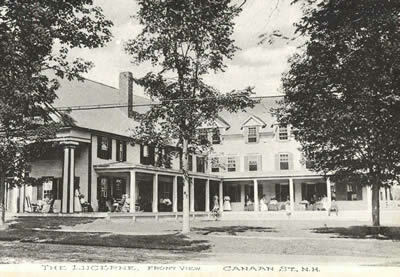 Canaan Inn was a major way point. 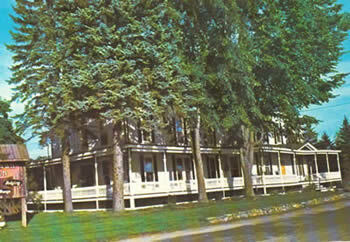 Through the 1950's the downtown area was busy as residents came into town to do their weekly shopping, attend a movie, have lunch or dinner at the Canaan Inn or Diner, or enjoy a drink at one of the cafes. 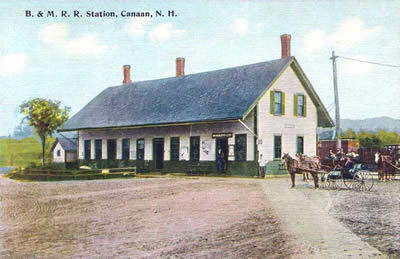 The new Boston & Maine Railroad Station was a hub of activity for loggers, farmers, and manufacturers. Passenger trains stopped at the depot day and night. 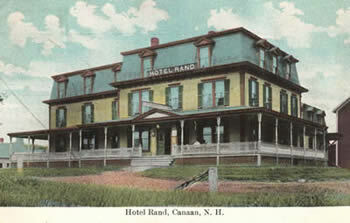 The Canaan Inn continued to flourish in the Village. 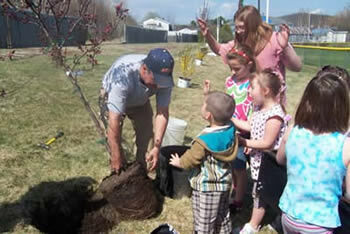 Today, a variety of small and home-based businesses continue to thrive in our rural community. These range from seasonal snow plowers to artisans, consultants to manufacturing companies. 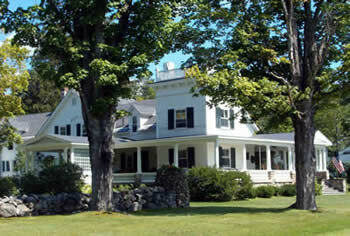 Canaan Village provides retail businesses, a bank, post office, restaurants, elementary school, senior center, and a veterinary facility. West Canaan and Canaan Center have maintained their identities and locally owned stores offer a convenience for the families living there. 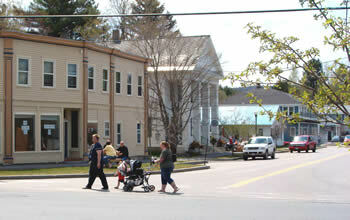 The library, recreation field, and the town offices bring residents to town for pleasure and business. 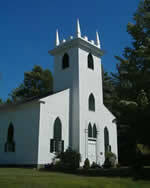 Meeting halls for social groups and three churches serve area residents. 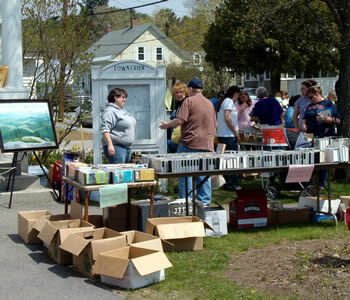 The Downtown hosts the Lions Club Concert, the Canaan Farmers' Market, and Old Home Days and continues to be the hub of Town activity. 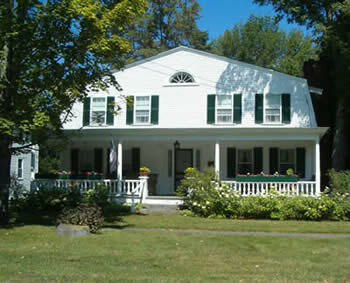 Canaan Street's architecture and character, carefully preserved through the efforts of the Historic District Commission, continue to reflect the culture and history of the entire town. 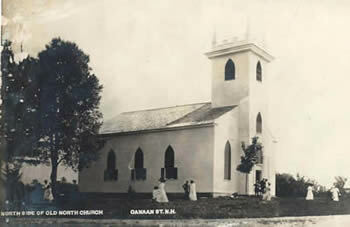 Just as community members came together to create Canaan, then rebuild the Village after the fire of 1923, community members continue to come together to renew the community every day. 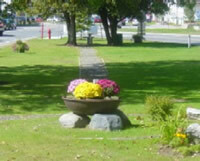 made the Village Center an attractive and beautiful area, and built a vibrant recreation area in the Downtown. Presentation DVD now for sale! Click to Learn More.